Home News On the Loose … Snails Leave a Learning Trail! On the Loose … Snails Leave a Learning Trail! Did you know that snails leave a broken slimy trail whereas slugs leave an unbroken one? Year 1 students learnt this first hand this morning when two snails escaped their enclosure, leaving a slithery trail across the classroom floor! 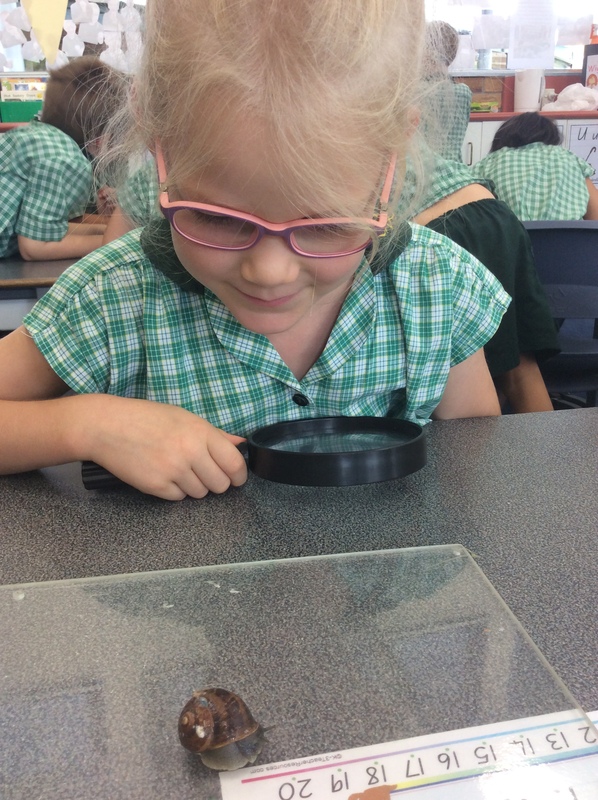 This is just one of God’s little creatures that year 1’s have been studying this term, as well as earthworms and ants. Students have observed and looked after these creatures in their classrooms answering questions such as: Where do they live? What do they eat? How do they move and what parts of their body help them do so? The biological sciences unit entitled “Schoolyard Safari” has given students opportunity to observe the similarities and differences among living creatures, leading to a better understanding of how an animal’s features help them survive in their environment. This term has been an enriched learning experience for both students and staff and has been very much enjoyed.